Thank you to University of Chichester Fine Art department students Trudie, Dennis, Charlotte, Jenny, Rebecca, Ali, Chris and Emma for talking to me last week about their astonishing work, it was a privilege. Thanks of course also to Chris McHugh for inviting me and to both he and Shirley Chubb for making me feel so welcome. Where the wholly reasonable instinct of architecture students is, often, not to stray too far from the strong disciplinary centre of the profession, for these fine art students no such disciplinary gravity exists or, if it does, it is entirely the construct of that particular practitioner. For me this was terrifying and liberating. Disciplinary centres do, of course, serve an essential function—interesting, ground-breaking, and moving work continues to be made deep within architecture and archaeology (the usual subject of my interdisciplinary forays) and art, but for work to be self-critical it must look not just to its centres, nor even its peripheries, but to the space between where the influence of parent disciplines is weak and thus available to interdisciplinary practices; space where we can, if not all, then many of us, be something like archaeologists or artists. Below is a kind of map I drew for my PhD describing the interdisciplinary journey I was taking from architecture towards archaeology. Chart of the Scandalous Space Between Architecture and Archaeology. Before the Chichester tutorials began I talked to the department about the image at the top of this page (updated from the version in my last post) currently on display at the University of Brighton’s Marks Make Meaning exhibition. 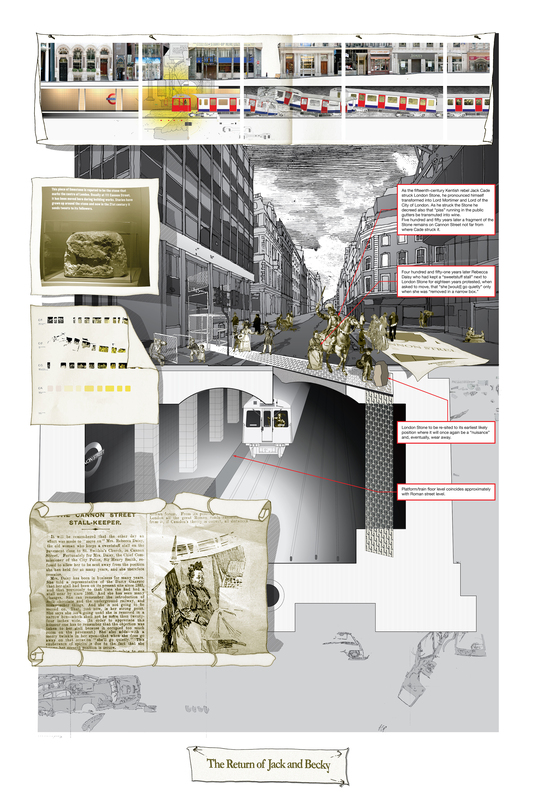 There are fuller explanations of what this drawing depicts here and here, but briefly it explores coincidences of event, time and place at the current location of the probable Roman artefact ‘London Stone’ on Cannon Street in London, gathering together a cast of characters, both real and mythical involved in its history. All of this ‘cast’ have been represented in proximity to the Stone throughout its recorded visual history. Controversy surrounding the original, historical and current siting and display of the Stone invite a looser, more radical response to both its display and to the representation of the object and its manifold contexts. The drawing therefore employs a variety of what I describe as ‘undisciplined’ drawing techniques: drawing practices less strongly associated or, in some cases completely unassociated, with any putative parent discipline.